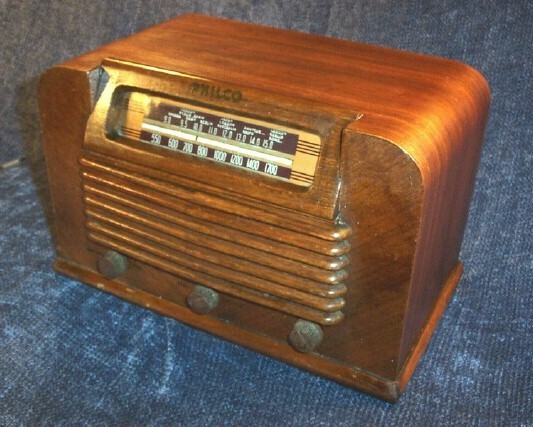 Beautiful wood radio with unique wood grille and reverse painted glass dial restored to near original condition but still showing antique patina and a few stress marks. All capacitors, weak tubes and resistors replaced. Aligned, tuned and calibratedfor excellent broadcast and shortwave on just internal loop antenna. Audio circuit adjusted and speaker conditioned for outstanding audio. All original except period line cord. 117VAC/DC, six tubes, 13? "W x 9"H x 8"D, 9 lbs. You are visitor number 2,776 to this page.